When searching for resumes via search engine, search engine operators can be a powerful tool to help you narrow your search for specific types of information and page content. These operators help you find the pages you are looking for without having to browse through dozens or hundreds or search results. Combining these meta search terms with Boolean Logic and keywords will help you quickly get results in your online resume search. Unlike having to learning Boolean logic on your own, fortunately, many search engines like Yahoo, Bing and Google list and describe their advanced search operators to help you out. 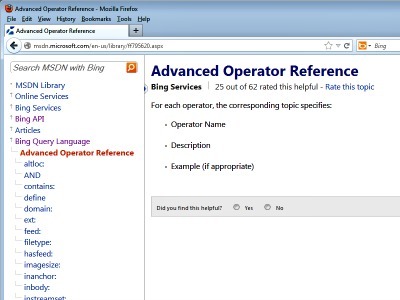 In the picture above, we've shown a page from the BING search engine that shows some of their advanced search engine operators. These terms will unlock the keys to the internet resume treasure chest! If you go to the advanced search tips on most search engines, there will be a section on advanced operators. As with Bing.com above, you will see operators like intitle: and filetype:. The operator intitle: is always followed with a keyword or phrase. The search engine then looks for that keyword or phrase in the meta data title tags of a web page. 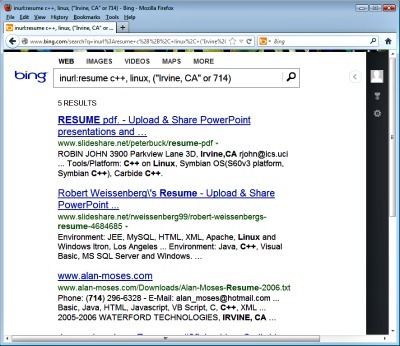 For example intitle:resume would search for web pages that have the word "resume" as part of their title meta tag. This means you can look at specific parts of a web page and narrow down the search quickly. Add a little Boolean logic, and soon you can target skill sets with the word resume in the title or url. Your online resume search will produce a number of the links to resumes. Each will have the word resume in their titles with c++ (a software language) and Linux (a computer operating system) living in Irvine, CA or within the 714 area code. You can see the words found as part of the search are bolded in the descriptions of the page location.